Epoxy overlays are typically utilized when damage to the surface of a floor is substantial but the slab itself is still structurally sound. 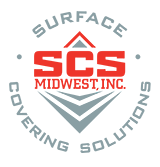 Application of an overlay to the surface of a slab allows it to be leveled out, gives it a uniform appearance and opens the door to numerous decorative options. This process also hides unsightly repairs to the slab that were executed before coating it. Texture, patterns and logos can all be added to the floor and many overlays can even be applied in an outdoor setting.